WhatsApp picture-in-picture feature could soon be available for Android users as well with integration of Youtube and Instagram video. According to the WABetaInfo report, WhatsApp feature is available in beta version 2.18.234, though it is still under development and has not been enable for beta testers. Added the feature “needs to get many other improvements”, before it can be made available. WhatsApp PiP mode will allow its users to view Youtube and Instgram video in the WhatsApp app itself. This means, a youtube or Instagram link sent on Whatsapp will not open on the youtube or Instagram apps respectively on the user’s device. The video will open in a small bubble in chat window of the user who has sent the link, but it will not work for Instagram Story links. When the picture-in-picture feature us available on WhatsApp for Android. You will be able to see White-colored play icon on Youtube or Instagram video link share on the messaging app. This box can be expanded or placed anywhere within the app itself. Meanwhile you will be able to continue texting with your contacts. The video will keep playing till the time you are on WhatsApp. And it will come with play/pause , full-screen and close button. The size of the bubble can also be increased and it can be moved around the screen as well. 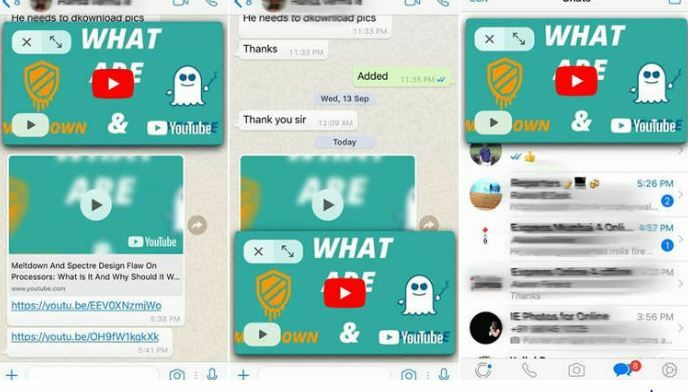 iPhone user already have the feature where they can watch Youtube video in PiP mode in WhatsApp , Android users have the PiP feature for video calls on WhatsApp. There is no information on the date of launch of the new feature, but since it has already been implemented in iOS app. So it should be available for Android soon. © 2019 - KrookNews. All Rights Reserved.